Welcome to Champions Luxury The pool area is where you will spent most of your time. Full equipped kitchen with stainless steel appliances. The breakfast bar seats up to 4 guests. Spacious living area with 55-inch SMART TV. Comfortable seating throughout. Beautiful dining room to seat up to 10 guests. First floor master suite features king bed and ensuite bathroom. The master ensuite bathroom with access to the pool area. The master ensuite bathroom features dual vanity and walk-in shower. It also has a garden tub. Master bedroom with king bed located on the ground floor. A full shared bathroom with dual vanity and walk-in shower. The Frozen bedroom with twin over twin bunk beds for all the princesses. The princesses will have their own 32-inch and share a full bathroom. The superheroes will have their own Iron Man theme bedroom with twin beds. They will also have their own 32-inch SMART TV. A Jack-n-Jill bathroom for the little ones. The second-floor loft area features comfortable seating and pool table. Spend your day playing pool with comfortable seating. The games room features 48-inch SMART TVs, Xbox, and PlayStation 4. Spend most of your time in the Transformers theme games room. There is also an Air Hockey and Foosball table. Get comfortable and settle in with these game chairs. Enjoy the 120-inch projection screen in the theater room with comfortable seating for 6. This master bedroom features a king bed located on the second floor. This king master bedroom is located on the second floor. A Jack-n-Jill bathroom for the master bedroom features dual vanity and walk-in shower. This master bedroom features a king bed located on the second floor. This master suite is located on the second floor. A full shared bathroom is located on the second floor. Have a meal in the outdoor table with seating for 8. Soak in the Florida sun with your family. Breathtaking view from the pool area. This beautiful pool villa awaits for your next vacation. Put your vacation home search to rest. Over 3,000 sq. 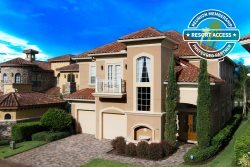 ft., this newly furnished 8 bed 5 bath home is the home away from home for your next vacations with an open floor plan throughout for you and your family. The living room area features luxury furniture package and a 55-inch SMART TV for all to enjoy. Cook your meals in the fully equipped kitchen with stainless steel appliance and breakfast bar. You can also enjoy the dining table with seating for up to 10 guests. In this home, on the first floor, you will find two master suites with king beds and en-suite bathrooms featuring dual vanity, walk-in shower, and garden tub for relaxation. You can also find the patio area with an outside dining table seating 8, sun loungers, access to the master suite bathroom, private pool and spillover spa to soak in the Florida sun. There is fun for all in the games room with an Xbox, PlayStation 4, gaming chairs, 48-inch SMART TV, and more. On the second floor, you will find the rest of the bedrooms. There will be four master suites with king beds and Jack-n-Jill shared bathrooms. The princesses will have their own bedroom with two sets of twin/twin bunk beds. The kid's bedroom features twin beds. The kid's rooms will have 32-inch SMART TV and share a full bathroom. There is more fun on the second floor with the loft area with a pool table, bar seating and a loveseat. Sit back, pop some popcorn and enjoy your favorite movies in your own private theater room with stadium-style seating for 6 and a 120-inch projection screen. Let us plan your next vacation with all that Champions Luxury has to offer you and your family. *This property does not include a BBQ, however we do have them available for rental. An Accidental Damage Protection (ADP) fee will be required to cover any reported accidental damage to this property and its contents. Pool heat available and is recommended from the 31st Oct. to the 31st Mar. If you would like the Spa / Hot Tub to be heated you will need to add pool heat to your reservation. We had a wonderful experience and did not want to leave. We would definantly return. They were easy to work with and the house was amazing! The house had something for every age. The kids loved the pool, game room, and theater. The bedrooms were comfortable and all around wonderful. Tudo foi perfeito, as casas sao maravilhosas e tem tudo necessario para uma otima estadia. Overall our stay was excellent. The home was great for multiple families and we will look into Reunion again.